I am very concerned for all the people that I know who live along the Gulf Coast of Texas as category IV Hurricane Harvey makes landfall. 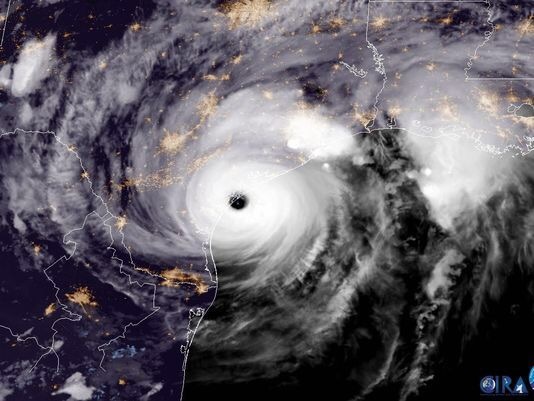 That storm is likely going to be one of the most devastating to Texas and the United States in many years. I’ve lived through more hurricanes than I can count going back to Hurricane Gilbert in 1988 where I was the director of a Red Cross emergency shelter in San Antonio for refugees from the same region being crushed by Harvey. Unlike Harvey, Gilbert moved fast and wasn’t a huge rainmaker, but Harvey will be a killer, and all the President can do is pardon a man who violated the civil rights of thousands of people and who only has told the people of Texas “good luck.” Now he did sign a disaster declaration for the state but if he continues on with threatening a government shutdown and debt default if Congress doesn’t pay for the wall that he promised that Mexico would pay for, and his proposed cutbacks to every Federal agency that would normally be there to help citizens in such an emergency what will that matter? This is truly a frightening time. We have a President who shows no regard for the law or the Constitution and who cannot even mention the military personnel and police officers that died over the weekend during a campaign rally? I mean really. And now he goes to Camp David as Texas stands on the brink of disaster. Will he not at least do a flyover abroad Air Force One as former President Bush did during Katrina? Can he not interrupt his Twitter storm against people he believes are his opponents not to show a modicum of respect for dead military personnel and police officers? Actually he cannot because he has no moral center. The President has demonstrated time and time again that he is a narcissist and sociopath who cannot feel empathy for anyone, even his supporters, many of whom will die this weekend in Texas as Harvey parks himself over them. If you have been blessed not to have had to go through a major hurricane or lose property and money due to one you are fortunate. No hurricane, but especially category III and IV hurricanes are not to be trifled with. But then he does have the time to sign a ban against patriotic Transgender Americans who meet every physical and mental requirement to serve in the military from doing so. The fact that his order will be shown to violate the 14th Amendment and will be held up in the courts does not seem to bother him. The fact that he who enjoyed multiple draft deferments during the Vietnam War, including a medical waiver for having heal spurs even as he played college baseball and was being scouted by major league teams would forbid qualified Transgender Americans from serving when none of his service chiefs ask him to do so is dumbfounding. This week the President has called journalists the enemy, refused to honor the lives of 20 American servicemen and police officers who died in the line of duty, but whompardoned a man convicted of defying the courts in order to violate the civil rights of the prisoners in his charge in direct contravention of Justice Department guidelines on pardons. Yes, other Presidents have pardoned undeserving individuals, but this sends a message to Federal prosecutors, the Congress, and Special Prosecute Robert Mueller that if any of them dare to indict or convict individuals connected with the ongoing Russia investigation that he will pardon them in defiance of the law. It is setting up the very really possibility of a constitutional crisis. The utter contempt for the law, the Constitution, and the basic decorum of his office, coupled with his lack of compassion and empathy for anyone, including his supporters, and his lack of any strategic thinking in terms of foreign affairs is frightening. Only a despot would behave as the President does. My comments today are in no way disrespectful of the President, but are based on my respect for the office that he occupies and the Constitution of the United States. I do not know why the President is behaving in the manner that he is, but I have to at least consider that for all of the personal criticism leveled against him and his actions that the demands of the office are harming his mental and psychological capacity to function. He seems to be cycling down before our very eyes and truthfully I am as much concerned for him as I am the country. But it doesn’t seem that those closest to him have the moral courage to demand that he seek help before he destroys himself and possibly the country. I mean what supporter, especially Christian clergy, could not be concerned for the physical and mental health that the man that they elected President? But it doesn’t seem that they care, so long as he helps give them what they want. On the other hand any decent person can both oppose a President’s actions and policies while still caring about him as a person. Human decency requires that those serving in the administration, members of the President’s political party in Congress, and ordinary citizens have the moral courage to care enough about Donald Trump the man to start asking those hard questions. These are not normal times and no one in full possession of their faculties behaves in the manner the President is behaving. In the meantime I will be praying for all the people I know in Texas, those who have died in the line of duty, and yes, even the President.